We are a professional breakdown recovery company operating in East Yorkshire and surrounding areas. As a successful family run business, we offer a wide range of recovery services, ranging from motorbikes through to fully laden Large Goods Vehicles. No job is too small or too big, whether it is a simple breakdown or a road traffic collision requiring off-road ancillary equipment. We are committed to providing a fast efficient reliable service for all our customers. We also provide a car and commercial roadside assistance service to ensure we get our customers back on the move as quickly as possible. Bell Truck Services are members of Road Rescue Recovery Association and the Institute of Vehicle Recovery. All our staff are fully trained and conversant with the recovery of all types of vehicles ranging from Coach Recovery, Heavy Recovery, Lorry Loader, Light Recovery and Hazchem/ADR. 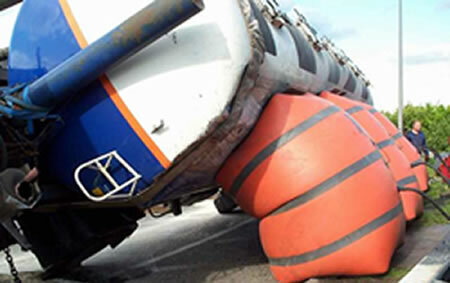 We specialise in Damage Free Air Cushion recovery, used mainly in the recovery of goods vehicles. Our air cushion recovery system can be deployed very quickly and can perform up-righting operations to fragile cargo in locations not accessible by heavy equipment .